Expand your collection with characters from all over the universe! The Science Fiction Pint Size Heroes include favorites from properties like Futurama, Star Trek, The Matrix, Mars Attacks, Alien, Predator, Back to the Figure, The Fifth Element, and Lost in Space. These blind bagged figures measures approximately 1 1/2-inches tall. Collect them all! 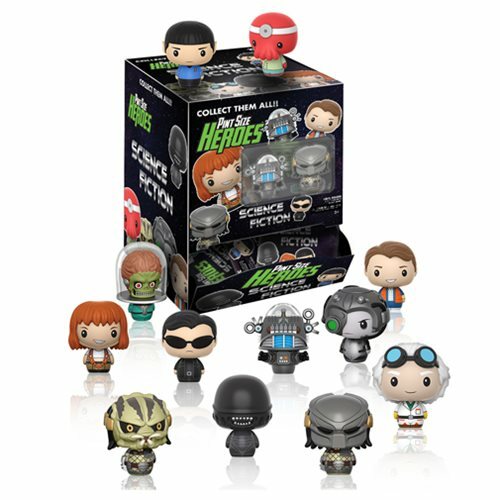 The Science Fiction Pint Size Heroes Mini-Figure Random 6-Pack includes 6x individually blind bagged figures, randomly selected. Breakdown not available at this time. Please note: This item may have variants randomly inserted throughout the production run. We cannot accept requests for specific variants, nor can we accept returns on opened items. The item you receive may be different from the one pictured.